"Rats everywhere!” cried the headline on a recent Nextdoor post, followed by nearly 100 frustrated-sounding homeowner responses. These days, seems like everyone has a rat story. Like a close neighbor abandoning her home after being repeatedly bitten by rat mites and another who got hit with $5,000 in car damage from rats chewing through electrical wires. That’s in addition to the common complaints of disappearing bird or pet food, holes in tomatoes and citrus, and droppings in the garage. So, what’s up? University of California scientists say last year’s wet weather created a perfect environment for rats to flourish; the abundant rains produced loads of weeds and seeds, a good food source for them. In addition to carrying fleas and rat mites that may bite humans and domestic animals, rats transmit serious diseases like murine typhus, salmonellosis and rat-bite fever. Humans can contract these diseases via water or food (think your fruit and vegetable gardens) that has been contaminated by rat feces or urine. How can you keep rats from becoming a problem? Prevention. • Begin by cleaning up. Harvest or pick up fruit, nuts and vegetables as they ripen; feed your pets during daylight and remove uneaten food right away. Keep garbage and recycling cans covered, and store bulk foods, bird seed and dry pet food in rat-proof, covered metal containers. • Take away their home. Remove garden debris, trim trees, shrubs and vines so they are at least 4 feet away from roofs and utility poles; thin heavy vegetation from around buildings or fences to eliminate hiding places. • Keep them out — seal openings the size of a dime or larger using rodent-proof materials where pipes, cables and wires enter walls and foundations. Weather-strip front, side and garage doors so they close tightly and repair damaged ventilation screens. • Encourage a natural method of rodent control — provide a safe habitat for raptors. These birds of prey — hawks, falcons and owls — are voracious; a family of barn owls can consume about 3,000 rodents each year. Barn owls are especially beneficial as they’re nocturnal hunters, out when many rats are doing their damage. 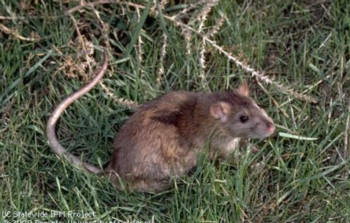 Rodenticides, poisons that kill rodents, are a major threat to rodent-eating predators. After ingesting poisoned bait, rats go back to the wild, taking up to a week to die. Any predator that eats the tainted rat may be seriously injured or die; the effect is multiplied when a raptor parent feeds the poisoned animal to its young. Data collected by WildCare, the San Rafael wildlife rehabilitation and nature education center, indicates that 76 percent of all animals brought to its wildlife hospital from 2006 to 2017 showed some level of rodenticide in their blood, even animals not suspected of exposure to the poisons. If you want to attract barn owls with a nesting box, don’t do it if you know your neighbors are using rodenticides. • Want to eliminate rats from the house or garden? Trap them. Large snap traps are inexpensive, can be used repeatedly and are environmentally sound. You can also purchase rat zappers, battery-operated traps that kill the animal quickly and humanely, and are a hands-off method for dealing with the dead animal. Don’t use glue traps — they cause a slow and painful death to any creature that touches it.